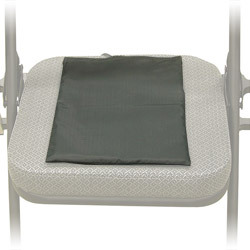 Our Activity Sensor Seat Pad Model 76879S is an accessory to the Lafayette Instrument LX4000 Computerized Polygraph Systems. It is designed to detect minor movements as well as major movements of an examinee during a polygraph examination. By providing a graphic record of movement, the Activity Sensor allows the polygraph examiner to observe the examinee's responses that may not have been seen during observation. The sensor pouch is located under the seat of the subject. As the subject moves, pressure changes are detected from the pouch. The Activity Sensor is constructed with multiple sensors to detect movement over the entire area of the seat. Unlike the previous weight sensing Activity Sensors, this unit provides automatic zeroing of the measurement range independent of the weight. It also eliminates the "out of measurement range" problem that frequently occurred on the old Activity Sensor. The Activity Sensor is a precision instrument capable of detecting very slight movement. With the sensitivity of the polygraph set high, the Activity Sensor may detect heartbeats or respiration signals on some examinees. Although the Activity Sensor is very sensitive, its design is kept simple for ease of operation and to provide many years of trouble free operation. The Activity Sensor plugs into the auxiliary input. Once the examinee is seated in the chair, the signal can be centered and magnified using the same computer control used on the standard four polygraph signals.